Digital Pianos Which Brand Should I Buy? You’ve been given lots of conflicting advice and don’t know what to do!… Help! Have you experienced something along these lines? They say “No, no, no, the Roland digital piano is better than the Yamaha, and far better than the Kawai”. They then sit down and play the Yamaha, and then the Roland and convince you that the Roland would be far better for you than the Yamaha and the Kawai. You trot off to another piano shop to get some more advice and to compare prices. Again you walk in and you’re confronted by a similar set up. The salesperson, like before, shows you the different digital pianos and advises you that the Kawai is the best piano, not the Yamaha, and CERTAINLY NOT the Roland. “Roland digital pianos are overpriced!”, they say. “They don’t know what they’re talking about!”, the salesperson says. Now you’re totally confused and walk out of the store with no idea who to believe. If you have experienced something similar to the above, and you’are at the end of your tether, then I’m here to offer you some unbiased advice on which digital piano you should consider. In this report you’re going to find out the merits, pitfulls and popularity of each brand. You’ll read about each brand’s strengths and weaknesses. And you’ll also discover exactly what I think of them (hold on to your hats!) You can also view a list of the most popular digital pianos. Yamaha are the most well known digital pianos. Their most popular lines are the home piano range (CLP Clavinova), the entry level (YDP Arius), and portable stage pianos (P Series). Yamaha also offer the CVP Clavinova and AvantGrand range. Yamaha’s best sellers are: YDP163 and P115. Yamaha Strive to make their digital and stage pianos sound and feel as close to a real piano as possible. The sound sample they use for their digital pianos is taken from their own acoustic concert grand. Advice: Buy any model from the CLP range, (if your budget allows). Second best choice is the YDP range. For gigging, choose a P series stage piano. Price: Starter digital pianos start from around £800, portables from about £450. Email: grahamhoward@ukpianos.co.uk for questions about Yamaha digitals. Roland digital pianos have a warm, mellow, and rounded piano tone around the centre of the keyboard. The keys feel nice under the fingers. Roland stage pianos rank amongst the best (RD and FP range) — The realistic key touch and sound is just what’s required for travelling professionals who perform for a living. If I were to buy a new stage piano then the Roland FP90 would be my first choice. Advice: Go ahead and buy any Roland digital piano from the HP, RD, DP, RG or FP range (you pay a little bit more for a Roland, but they’re reliable and rarely go wrong). Price: Basic models start from around £600. Rent-to-Buy from £35 per month. Rental goes towards price. Advice: Kurzweil offer a nice range of digital pianos, stage pianos and keyboards. Their student model, M110, is really good value, and their mid-range model, MP120, has a really authentic sound. Their multi-functional piano, MP15, competes well against more expensive pianos from other makes. Kurzweil’s grand piano CGP220W and top of the line home piano CUP320 are beauties… their keys are wood and feel firm and solid – you’d think you were playing on a real grand piano. Price: Stage pianos from£599, home pianos from £899 . Rent-to-buy from £45 per month. Advice: Gewa, one of the largest musical instrument companies in Europe, are fairly new to the piano market. I remember seeing their first range of digital pianos in a music exhibition in Frankfurt, Germany. I thought ‘they’re mediocre pianos… they sound alright and feel okayish to play. Nothing special really’. But that was 6 years ago. Today they have a complete new range of digital pianos that compete and even excel against the equivalent priced Yamahas and Rolands. All Gewa pianos are 100% made in Germany. They’re sampled on a Steinway concert grand. And their build quality is outstanding. Well, what else could you expect from the Germans? My favourite in the range is the UP260G. This is the piano I do my daily practice on in the UK Pianos showroom. Price: Prices start from £999. Rent-to-buy from £55 per month. Digital Piano Buyer's Guide: "7 Things You Must Know Before You Buy A Piano"
Kawai digital pianos have a nice key weighting with adequate resistance. Kawai have a vast range of models and colour options. Advice: Kawai offer a vast range of pianos at different price points for beginners up to advanced level. Price: Budget learner pianos start from £700. Casio offer three ranges: The Celviano, Privia and Hybrid. The key weight is nice, but a little springy, and the sound is OK considering the price you pay. The privia pianos (px range) don’t sound as good as the Celviano range. They’re a little tinny because of their small cabinets and speakers. On the first Privia models (PX100), the keys were quite rattly and had too much side to side movement. Casio have vastly improved this now. Each new model they bring out performs a little better. Casio digital pianos were considered mediocre a few years ago, unable to shake off their ‘calculator and watch’ image. But we’ve seen positive signs of improvement lately. Casio digital pianos aren’t as good as the big 3 (Roland, Yamaha and Kurzweil), but they’re generally cheap digital pianos designed for beginners – between half and two thirds the price of a Yamaha and Roland. Advice: If you need a basic piano with loads of versatility (gadgets), then go ahead and buy a Casio digital piano from the Celviano range (Casio AP). You may want to consider the Casio Privia digital piano range if you’re short of space and your budget is tight. There’s also Casio’s very vest pianos – The Grand Hybrid range: GP300, GP400 and GP500. But for the price you’d be better off getting either a Yamaha CLP or Roland HP piano. Price: Basic models start from £300. so they feel very much like playing a real acoustic grand. Price: Portable model is £499. Home pianos start from £599. Rent-to-buy from £39 per month. Classenti pianos offer a warm, resonant and realistic piano sound. The touch is heavy-weighted and authentic. There’s lots of good reviews from delighted customers. The current range is quite old now though, but I’ve heard Classenti are developing a new range. Watch this space! Advice: If you’re buying your first piano and you want a decent sound, a realistic touch at an affordable price, the Classenti CDP1 is a good choice. The digital baby grand (DG1) is the most compact mini grand on the market, and great value at under £2,500. Price: The first model in the series (CDP1) starts at around £600. These pianos are sold only online. Call 020 8367 2080 for the best deals. Advice: A really good range of digital pianos that are ideal for anyone learning to play. All Hadley digital pianos have the correct weighting on the keys. Their base model (D10) is excellent value and is the piano I recommend for children to learn on if you’re on a tight budget. Price: Basic models start from £399. Rent-to-buy from £35 per month. Korg are better known for their high end keyboards and stage pianos. Although they do offer a limited range of budget pianos that compare well against other makes. If you’re on a really tight budget then check out the B1. Korg digital pianos are fairly priced but, overall, their performance falls a long way short of the top manufacturers: Yamaha, Roland, Kurzweil, Kawai and Gewa. Advice: Wouldn’t really consider a Korg digital piano, but some people like their sound. Price: Basic models start from £400. 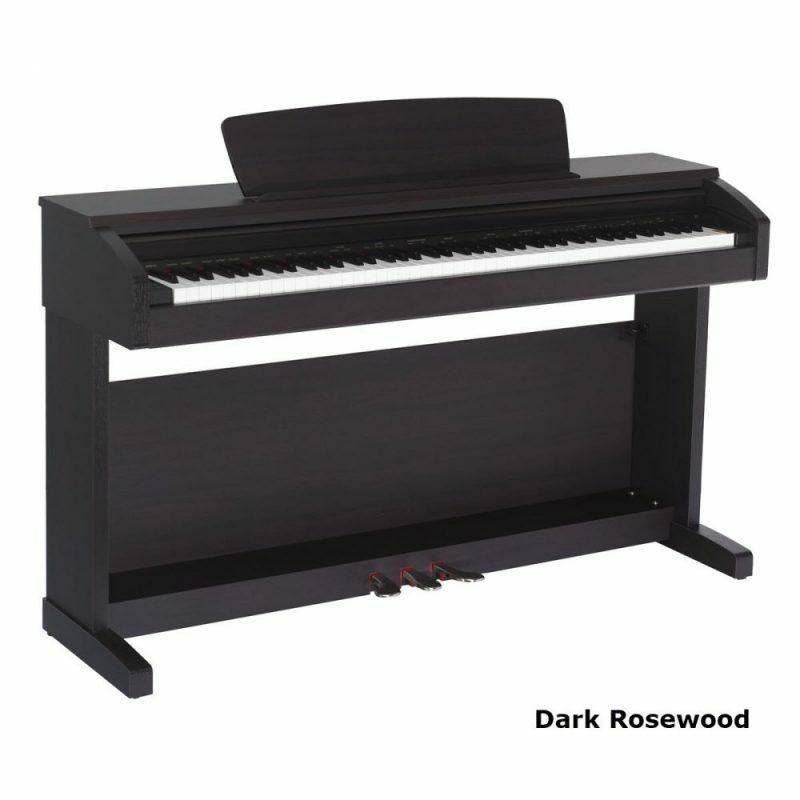 Gear4Music pianos are priced close to the bottom end of the market… they’re really basic. You can pick up a beginner’s digital piano for around £300 – £350… For that money it’s hard to find anything better. Suzuki make great motorbikes… but digital pianos? Their digital pianos, however, fall well short of the mark. Advice: Buy the Suzuki digital piano only if you are on a really tight budget. Price: Basic model starts from RRP £799. Gem (short for General Music) looked nice and had a good name behind them. They did lack in quality though. The sound wasn’t that good and they offered only a limited range of digital pianos. Advice: Gem pianos ceased production in 2009. There were less than a handful of Gem sellers in the UK when they were at their prime. You may be able to find the odd one, or two for sale in the secondhand market, but be careful. Finding spare parts for them are difficult now. Price: Basic models used to sell for around £700-£800. Alesis, Amason, Andante, Axus, Baldwin, Behringer, Bentley, Bluthner, Bohemia (no longer in production), Chase, Classic Cantabile, Cranes, Daewoo (no longer in production), Delson, Dexibell, Digiano, Diginova, Digitech, Dynatone, Eagletone, Ensoniq, Farfisa, Galileo, Gem (no longer in production), Hammond, Hemingway, Ketron, Kobrat, M-Audio, Mantova, Minster, Orla, Pianonova, Rikter, Ringway, Robertson, Samick, Sejung, Solton (no longer in production), Studiologic, Sulinda, Technics (no longer in production), Viscount, Wersi (no longer in production), Williams, Worlde. Click here to find out how the above pianos rate in my book: “7 Things You MUST Know Before You Buy A Digital Piano“. Now you’re armed with the right information you can go out and buy a digital piano with confidence. Don’t take too much notice if you feel you’re being pushed towards any particular digital piano. Ask the piano salesman to demonstrate a few different piano brands and then make the decision yourself based on the above information and what you feel is right for your needs. You can buy a digital or upright piano on this website: www.ukpianos.co.uk. Most makes and models are available. If you can’t find what you’re looking for then email grahamhoward@ukpianos.co.uk for advice. What a fantastic website you have, you appear more of a philanthropist helping the world love pianos than someone who just wants to make money out of the business! something to be commended in this day and age! Q/ I am shortly taking early retirement and hope to learn the piano. I am considering a digital piano that be suitable for a beginner, but would also be suitable for advanced level should the need arise. I don’t need one with lots of bells and whistles, but would prefer a warm and rich sound, not something that sounds ‘tinny’. A head phone jack would be required for silent practise. Space is rather limited, as the piano will go in my bed room upstairs, so this would need to be taken into consideration. 1. Roland FP30, which had a really nice sound which I liked, but not sure what level this would be suitable for. The size seemed suitable. 3. Broadway B1 or B2. I’ve sadly been unable to find out what it sounds like. Please could you advise which would be suitable, or is there something else that I have missed. As this is a one off investment, I want to make sure that I get it right. My budget is under £1000, but could stretch a little further if necessary. However I would prefer to keep within my budget. A/ I like all the pianos on your short list. It seems you’ve done some good research. The Yamaha YDP163 would be my first choice. playing a real piano, and the keys are more sensitive. This would matter more when you reach a higher level. The FP30 or B2 would be most suited to a tight space. Being narrower, they take up less space than other pianos. The FP30 has the edge on key feel, but they both sound nice. Wanted to thank you for your inputs on which piano to buy. First the argument between acoustic and digital is very well put across. Secondly for first timers you simplify the jargons . Thirdly your comparisons allows us to be aware of the trade off we are making. There by allowing us to take a well informed decision. Thank you very much for your immediate email reply and and most applicable information. You are the expert! It’s reassuring to know that there are still people out there who want part with their knowledge to get others to appreciate music and playing whether by piano or any other musical instrument. Two summers ago I bought a digital piano to replace my old upright which had succumbed to moth in a terminal way! It seemed the best solution given our itinerant lifestyle. I went to THE piano shop in Norwich and tried a few Clavinovas before the salesman steered me towards the Kawais and proceeded to sell hard. Having recently read your online book “Digital Piano Buyer’s Guide”, which was extremely helpful and informative, I now understand why! Very many thanks for your most helpful advice on the CLP645. Thank you too for your absolutely brilliant buyer’s guide. I went into a first shop & listened to Yamaha clavinovas & Casios and I definitely preferred the Yamahas. Then I went into another shop & listened to the Kawai digital pianos and I then preferred the Yamahas. The salesmen in both shops were very nice & didn’t try to influence me, they just let me listened.. I’m hesitating between the Clavinova CLP635 & the Kawai CN37 both on the same prices… I listened to both of them and I preferred the Kawai sounds… however since I don’t know pianos I was confused by your ratings with Clavinova ranging firsts… Have you any advice on the new kawai CN37 ? A/ I have heard a lot of good comments lately about Kawai digital pianos. I did this comparison and review a while ago and having played the latest Kawai models – I have to say they are definitely improving! Still I would go for the Yamaha though. The touch is superb (close your eyes and you could well be playing an acoustic piano). The sound on the Yamaha has the edge over Kawai. How long this will continue… who knows? Many thanks for your answer; I bought the Yamaha CLP635 mostly based on your recommandations & on the fact they were at the same price. If the Kawai had been cheaper, I would have gone for it because it has more piano sounds & more features… however I had the opportunity to listen to both in the same shop this morning and I finally went for the yamaha.. Many thanks for your excellent digital piano guide, an impressive amount of information in laymans terms. Many thanks for your article ‘digital pianos – which brand should I buy?’. I have carefully read the article and it was really useful to get an insight of the quality and prices of different brand of digital pianos. I do have a Casio PS3000 digital piano and I can say I am satisfied with the quality of the sound produced and it was really good value for money, although I do not have it with me right now and I do really miss playing the piano as I am an international student at the University of Birmingham and finding a piano to play is not an easy job at all. I bought my Casio it for $1000 and it has a really good sound similar to the yamaha which is more expensive but with no additional features compared to casio, almost the same sound quality. I even found casio better than yamaha. Hope to get more articles related to digital pianos. Wish you good luck in you work. Thank you for your time and independent advice, freely given. It makes such a difference to hear the voice of experience. Thanks very much for the information – really appreciate all your comments – it helps as trying to purchase a piano is a mind field for someone who doesn’t have the knowledge! Q/ Thank you for this very informative article. Roland sounds good. Is the feel of the keys like that of a piano, or is it as light as the keyboard? Since I am a beginner, I have been asking every one for advice. I would value yours. A/ The key weight on digital pianos is lighter than most upright pianos and much heavier than keyboards, as a general rule. You need to make sure that the digital piano has a weighted action because there are some digitals out there that have keys weighted the same as a keyboard – for example the Roland EP760. The exception to the rule tends to be modern uprights, especially the cheaper end of Yamaha, Kemble, Kurzweil, Kawai and Broadway pianos where the key weight is almost identical to a digital piano. So, it really depends on which type of piano you are comparing with. As far as the Roland goes, the touch is on the light side, but much heavier than a keyboard. I would say that the Roland’s key touch is not far away from a brand new Yamaha upright piano with the exception of their Indonesian model B1 which has a stiff, heavy touch. My recommendation is to go for either the Roland, Yamaha, Kurzweil or Gewa. Thank you for all the help and guidance you have sent me regarding buying a digital piano which has been very useful as there are so many options out there. Thank you for your generosity in sharing your knowledge. It has been a great help to me. I greatly appreciated this article about choosing a digital piano. You clearly know this market inside out. Thanks for pulling together such an informative site – I’ve spent many hours reading through the reviews, the “7 things you must know” book and piano forum. Am so greatful for what you are doing and it is my prayer that God bless you so much. Thank you so much for the links you have mailed myself. I am in the process of getting my daughter a digital piano for christmas. This has helped me loads. Thank you for your invaluable advice through the book. It has helped me a lot in understanding the terms used for the specifications and what I need to look out for when deciding on a digital piano. Pauline, Malaysian residing in Indonesia. Thank you very much for all the very helpful advice in your book and email. I wouldn’t have known where to start without your help! I am going to have to save up a bit first, but as I had no idea about digital pianos, you’ve already saved me loads of time and effort, so thank you very much for that. When I do decide to get one, I’ll just read your recommendations again. I find Graham is a very professional pianist, on anoustic piano and on digital ones as well! Each time I need advise from him, he is always there and replies me in a responsible way. Just wanted to say thank you. I purchased a Yamaha digital piano after reading an article you wrote re the quality of digital pianos currently on the market. In the past I’ve rented acoustic baby grand pianos but currently do not have the space in my home. I ended up purchasing the YDP223 for around $1500 and couldnt be happier. Thank you for the information in your article (I almost bought a suzuki). This article was 99% of the reason I bought a Yamaha CLP625 so was an invaluable read. It does come across as an unbiased opinion especially as I believe that you sell Classenti and only put that company 4th in terms of overall score. I also found out about the Rocket Piano courses from your site and I’m currently making good progress with that course. So basically ukpianos.co.uk was by far the most influential site I visited. I liked the article. I thought it was very honest. You obviously know your stuff, so an honest approach will always be preferred by readers, controversial or not. I don’t intend to buy a digital piano at the moment, but I’m sure your article would be something I’d look at seriously if I did decide to. I’d rather go to buy one armed with a good idea of what I’m looking at than going in completely blind and having to play all the rubbish ones to find out !! I’m sure for most people, the important factors would be the price, how realistic the sound and how it feels. For me the feel would have to be just right for me to consider a digital piano over a real one. I only started playing a few months ago, on a pretty cheap keyboard (Yamaha PSRE303.. great beginners keyboard!!). As soon as I could play a little I bought an upright piano and now hardly ever touch the keyboard at all. There’s something wonderful about the feel of a real piano. It almost feels alive. It’s something I’m not sure you could truly reproduce digitally. Playing my keyboard is now a very detached experience in comparison to playing my piano. I have played on a Clavinova and thought it was very good indeed. I was impressed by the weight of the keys and sound quality was excellent. I didn’t spend much time on it though and as a beginner don’t really feel qualified to comment too deeply. Thank you very much for sharing your opinion on the best piano brand to buy. I wish I knew you a long time ago before I bought mine. After looking at the different brands, I ended up choosing Casio. I thought it was better than Yamaha because it had a screen that beginners can see which finger is being placed on each note as a song is played from the song bank. Although I have not chosen the better brand, I think that I have made a wise choice (for a beginner). However, I must assure you that if I happen to migrate I will have to buy another piano because this one is a bit too big to travel with. Then, I will choose Yamaha. Thanks once again. We need more people like you in this world. Graham, thank you for your piano information. I studied your “which digital piano” & set my heart on a Yamaha DGX 660, Clavinovas are out of my price range. I tried that & Casio Privia at Cookes of Norwich but when shown a Kawai CL37, which you didn’t think too highly of, I fell in love with it’s sound, very light touch , silent but weighted action & only 11 inches deep.